Innoo Tech magnetic building blocks-let your child learn through play! nice gift for little fingers if you are looking for a way to connect with your child and have fun, this is the gift! a value set of 76 pieces, a must buy for any kid and parent! so many benefits to your child - it's a new trend in creative play! imagination> let your child develop their creativity and imagination through exciting play. add to cart to get this durable, well made and non-noise making toy! creative, exciting and imaginative play! great educational toy! Educational & creative - a great creative toy that lets your child engage with their imagination. It's low-tech and creates very little noise. You child can develop their creative side and motor skills through play! Spark your child's imagination - all children aged 3 or up will enjoy the colorful world they can create with this set.The pieces are durable and safe so they can be used again and again to spark your child's imagination. Learn & play - if you are looking for a way to connect with your child and have fun, this is a must-have gift. You will love the pride you see in your child's face when they creates a new design. A toy that helps them learn really is the best of both worlds. 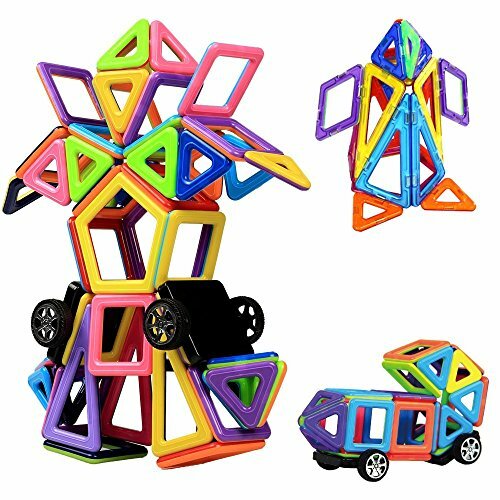 Innoo Tech travel sized magnetic building block set - a 76 piece value set including 26 plastic letter cards, 2 pentagons, 2 pairs of wheels, 20 squares, 22 equilateral triangles and 4 long triangles. Perfect to play on the go. And keep your child engaged during travel. While most customers have been really happy with them, some customers have felt they are a little small. Please check the pictures if they are going to be the right blocks before ordering. Many thanks! Instruction booklet and storage bag - the set includes with an idea book which will help to come up with new things to build. Easy to carry and store with our storage bag! 100% satisfaction guarantee - Innoo Tech offers all customers a 45-day money back guarantee and a free Exchange option. You also get a 12-month Warranty and perfect customer service. If you have any questions about this product by Innoo Tech, contact us by completing and submitting the form below. If you are looking for a specif part number, please include it with your message.